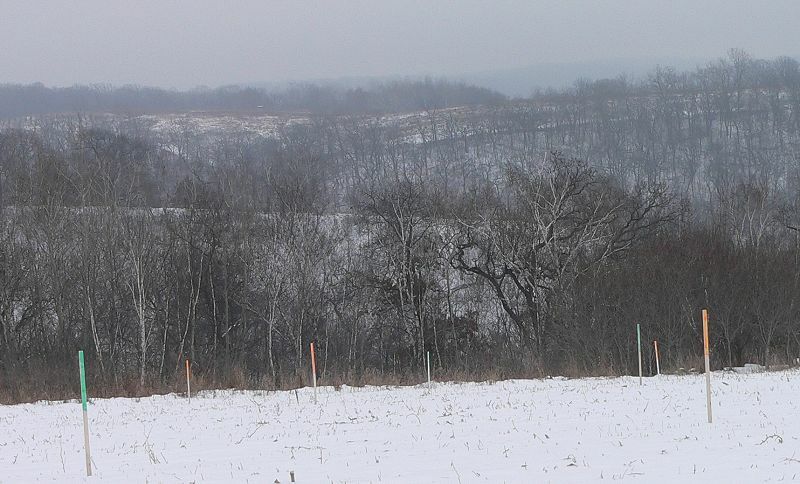 This was the very last hunting week of the year – a special season for areas with way too many deer. No one hunted our land, but we heard lots of gunshots all around us. 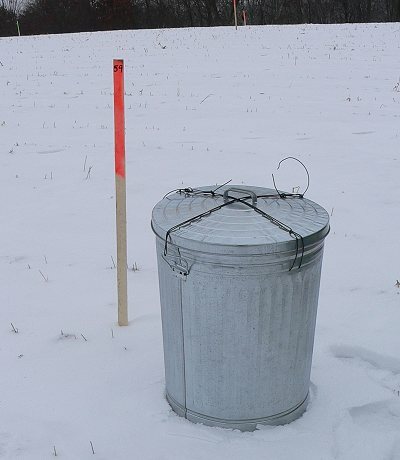 I spent the weekend finishing dividing my prairie seeds and packing them into metal garbage cans so I could drive them up to the top of the hill before the snow got too deep. 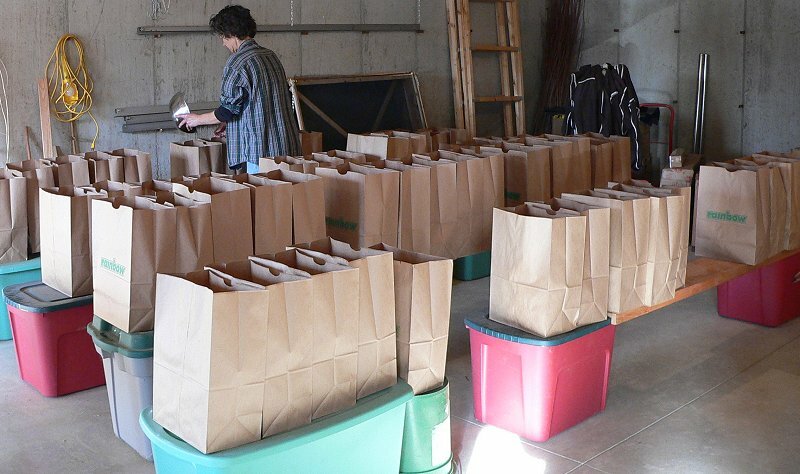 Here I am dividing the seeds into bags. I finally figured out that it’s much easier on my back if I raise the bags up so I don’t have to lean over them all the time. Mike helped me figure out how to get them all up, and gave me some boards to lay between the plastic bins. I divided the field up into 67 sections this year. When I divided the seeds, I made 60 bags of mesic/dry prairie seeds, 5 bags of savanna seeds, and two bags with a mix that includes all of my unusual and special seeds. 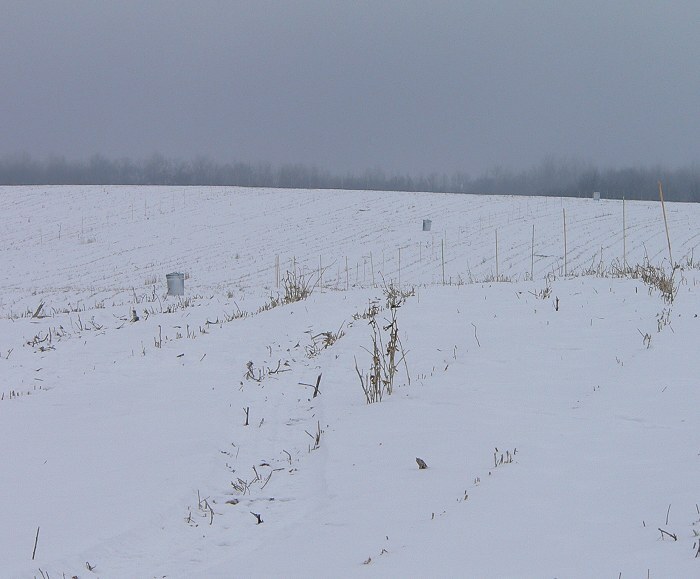 This special mix will be planted in two marked sections so it will be easier to find those plants without having to search over the whole 18 acres. The bags of savanna mix are for the 5 sections closest to the south end of the field, where the line of trees creates some shade. I also made one bag of fairly common, aggressive seeds to plant around the edge of the field where there are lots of weeds. To divide up each kind of seed, I pour it out on an old wooden worktable, and divide it into piles. Then I push each pile into a bowl and divide it into the bags. 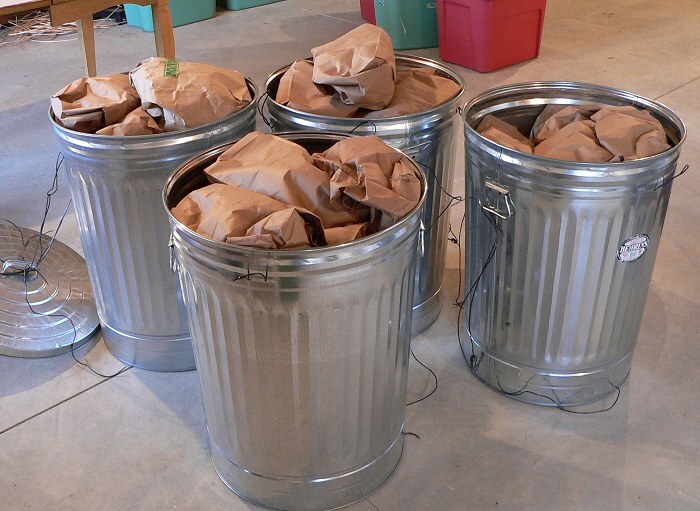 Here are some of the piles, ready to be divided into the bags. Finally, after I’ve divided all the seeds into the bags, I mix up the seeds in each bag. 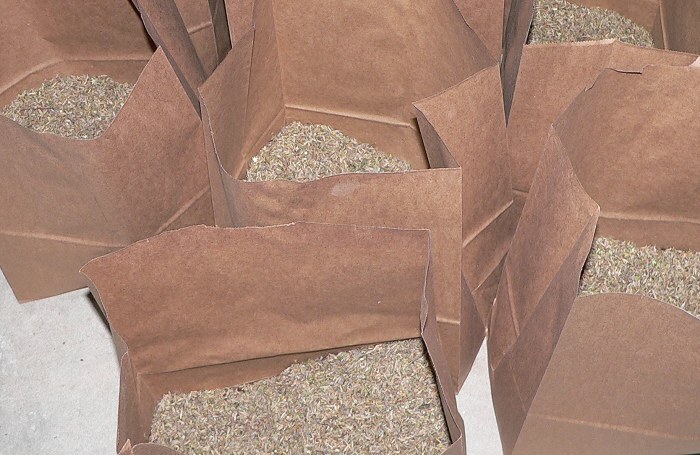 Here are some of the bags full of mixed seeds. 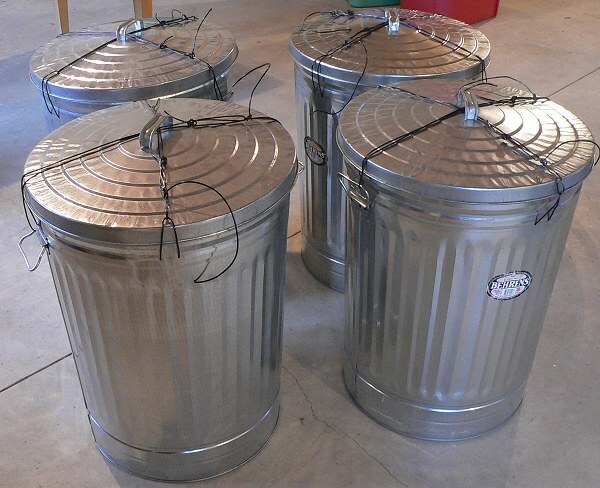 Then I pack the bags into 4 metal garbage cans. And wire the tops shut so the animals can’t get in. 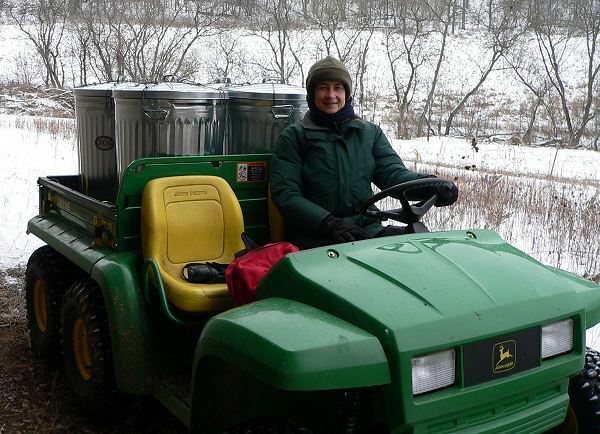 On Monday, when the hunters were finished, I packed the cans into the gator and drove up the hill. Here I am with the loaded gator. I was a little worried that the gator wouldn’t make it but it did. Now I know that I can drive through 5 inches of snow – and I didn’t even have to use 4-wheel drive. I dropped off the cans along the field so I don’t have to walk very far to get more seeds while I’m planting. Here’s one can. And here’s how 3 of them look lined up in the field. It was so nice and warm (20 degrees) that I started planting and got 5 sections done. 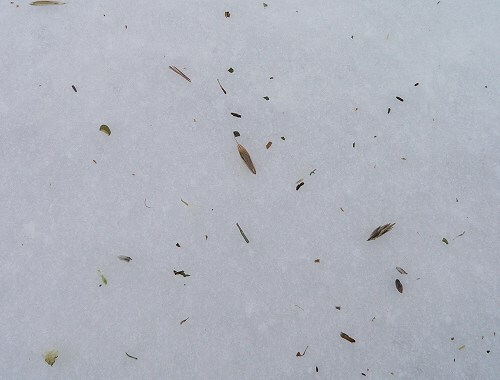 This is the way the seeds look in the snow. The view from the top is very bleak in the winter, but still beautiful. Later that day I walked up to the highest point on our land and explored. 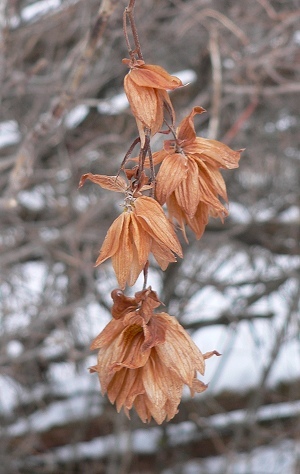 There are great views, and I found some a Hops vine, which has nice twining stems and seed pods that last into the winter. I found some contradictory information about the origins of Hops. Some sources say that it’s native to North America, and some say it was introduced as a preservative and flavoring for beer. The day after I did all this it started to snow and hasn’t stopped since. We got at least 8 more inches.